Get your home starter kit from panasonic. Easy and Simple to set up and fully integrated and compatible with your IOS or Android Phone. 1 x Hub, 2 x Window/Door Sensor, 1 x Indoor Camera, 1 x Smart Plug. 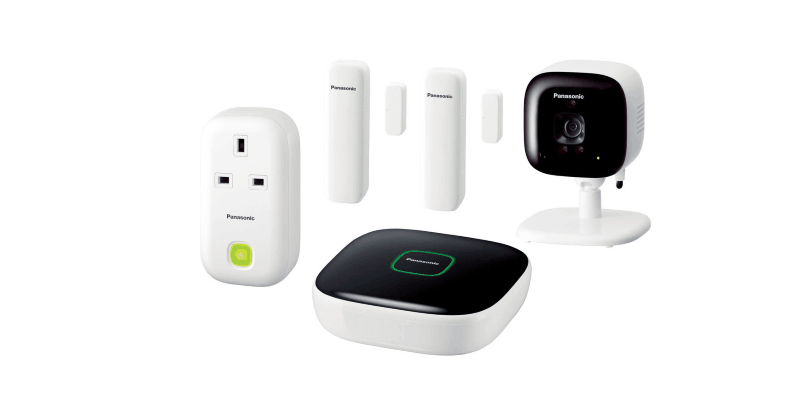 This Home Starter Kit by Panasonic gives you everything you need to keep your home safe and in full control! The install of each component is very simple and only takes minutes to set up. These are all easily connected to your smart phone or tablet. This Home protection kit can act as a burglar alarm whilst your away from the house giving you peace of mind. The kit also has a quality indoor camera to give you that extra bit of comfort and to easily check everything is safe. There is a smart plug included for control over your home appliances and you can easily switch them on and off from your phone! You won’t have any monthly subscription to run this system and you can also add optional extras should you require them. Take a look now at this Panasonic home burglar alarm and security kit today and you can have your home protected in minutes. Always in the loop – Access it anywhere!